For commercial use of this photograph please visit www.alamy.com and search for RJ9YND but for a one off print, please see below. This photo taken in 1975. To the right of the main entrance is the entrance to the cellar that has since disappeared. The steps into the building seem well worn and an upper window claims "Town View Restaurant." Note the gentleman's bell-bottom trousers. The name "Broad Street" on the building does not appear in later photos. Research in early 2019 revealed the following. This late 18th century Grade 2 listed building, constructed in the 1790s, was originally called Bank House and has been a glass and china shop, a fishmongers and a wines and spirits merchant. 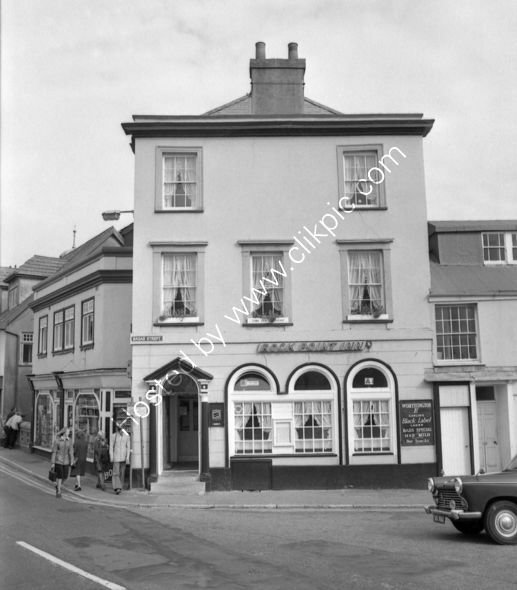 In the early 20th century it became a pub called the Vaults Lounge and later became the Rock Point Inn. At the time of this photo it was a tied Bass Charrington house but later became a free house. In late 2018 the pub and the Cobb Gate Fish Bar (to the right) were sold to St Austell Brewery as their first venture into Dorset. They stated that the pub would close for a few months in 2019 for a complete refurbishment in consultation with local planners and Historic England.